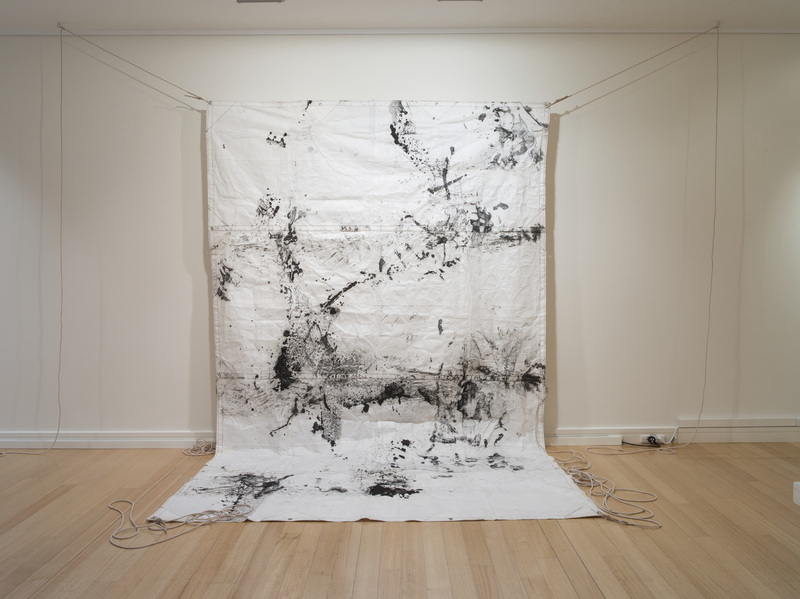 Shroud for an ancient basin, 2013, Jude Roberts, photo Carl Warner. Currently on tour with Bimblebox: art – science – nature. Jude Roberts’ studio practice encompasses large-scale drawings, lithographs and mixed media works on paper. Drawing and documenting on water sites through inland Australia has allowed the artist to investigate issues such as groundwater on the Great Artesian Basin. This has enabled her to observe the shifts, changes and human relationships to land, in particular its will to control these environments. Jude lived for many years on a pastoral property in south west Queensland before residing in Brisbane where she is currently enrolled in a doctorate of Fine Arts at Griffith University. My work employs various forms of drawing and print media both simultaneously open to factors of chance and improvisation. Found objects are used as tools in frottage, monoprinting and stenciling and with materials such as tusche, natural sediments, gouache, graphite and charcoal. Marks made unintentionally of the land itself, and the intentional interpretative markings made back in the studio form a collaboration between the land and artist. The processes for my art making has evolved from the physical sites that I work . I have documented different areas of the Great Artesian Basin and in the case of Bimblebox Nature Reserve, the Galilee Basin. This has allowed me to capture stains, impressions and materials found in the earth and water. These landscapes are constantly imprinted on by human use and changes in the earth. I see the skin of the earth as a floor for human and geological activity, but also a ceiling for the Basin and other natural and physical phenomena. This layer is always shifting and in constant tension particularly now with new challenges facing the earth with human forces accelerating the changes. Being on these areas has prompted me to question human concepts of time in relation to the geology and history . These intangible qualities of the real and imagined themes in my work are experimented with using various print making processess. Papers, particularly that of the lighter Japanese variety can be manipulated to cover objects in the landscape such as steel equipment and netting fences. Use of frottage over holes and forms are imprinted by rubbing crayons and other materials onto their surfaces. Laying paper over burnings with smoke, ash and coals has also been another way to capture these elements. In addition to these processes the works on paper have drawing and monoprinting aspects. The natural sediments used on the plates transfer onto the paper in an irregular fashion and with each press run, some sediment areas are taken away, others form layers like an accretion of the earths surface. In summary, my art making approach mimicks processes used by natural or human made interventions of land.